Mr.Derek Bennett Orthopaedic Specialist has just returned back from a very successful international conference at The TriStar Centennial Advanced Joint Replacement Institute, Nashville . Mr.Derek Bennett pictured with Doug Jackson President & CEO of Project CURE , Nashville. Project CURE is a charity with over 25,000 volunteers which donate refurbished medical equipment to third world hospitals and clinics. Orthopaedic Specialists from all over the globe gathered in Knockranny House Hotel ,Westport for the 10th Anniversary of the Mayo Arthroplasty Conference (MAC) . Left to right : Dr Don O’Malley, President of the Irish American Orthopaedic Society , Dr . Georgios Macheras, President of European Hip Society, Mr. Michael Ring TD , Minister for Rural & Community Development, Dr . Gerald Williams President of American Acadamy of Orthopaedic Surgery , Mr Derek Bennett President- elect of the Irish American Orthopaedic Society .Mr Gerry McCoy Immediate past President of the Irish Orthopaedic Association . Mr David Beverland , President of the Irish orthopaedic Association . More pictures to follow soon ! on their mission to Hanoi, Vietnam. Well done to all involved on this very successful trip. and Mr.David Cogley pictured with Minister Andrew Doyle and Cáit Moran, Irish Ambassador to Vietnam who visited the Operation Walk Ireland Team in Vietnam recently. February 2018 – New Audiology Clinic opens at Mayo Medical Centre. We are delighted to welcome Audiology Medical Services. Audiology Medical Services offers Adult and Paediatric diagnostic hearing tests. January 2018 – We welcomed Caroline Brosnihan –Dietician/ Nutritionist to Mayo Medical Centre. Mayo Medical Centre is please to announce that Caroline Brosnihan, Consultant Dietitian & Performance Nutritionist is now available for consultation every Tuesday ( by appointment only ). Caroline has extensive experience and success with providing weight loss advice and healthy eating plans. Caroline’s specific areas of interest include weight loss, heart health, bone health, digestive health and sports nutrition. Caroline graduated as a Dietitian from Robert Gordon University Aberdeen, Scotland with a BSc First Class Honours Degree in Nutrition and Dietetics and specialised in Sports Nutrition at St Mary’s University, Twickenham. Prior to completing her Nutrition & Dietetics degree, Caroline studied Heath Science & Physiology at I.T. Carlow. Caroline has experience working in hospitals and the community and since 2014 and also works at her private clinic Connacht Nutrition & Dietetic Clinic. She is also Dietitian and nutritionist to Mayo GAA football team. Mr Bennett is attending the annual Bristol Hip Arthroplasty Course 2017. We are hosting another public information Evening about Osteoporosis at Breaffy House Hotel on Thursday 16th November 2017. Speakers on the night include Mr Derek Bennett Consultant Orthopaedic Surgeon , Liam Leonard Chartered Physiotherapist, Carmel Silke Consultant Rheumatologist and Professor Moira O Brien President of the Irish Osteoporosis Society. MCA on the night is David Ukich Charted Physiotherapist. We held a Public Information Evening about Healthy Heart at Breaffy House Hotel . Thank you to our wonderful MC, Angelia Nugent from Midwest Radio and to our guest speakers Dr. Faial Sharif ( Consultant Cardiologist ) , Dr.Brian Hynes ( Consultant Cardiologist) , Caroline Brosnihan ( Nutritionist) , Ailish Houlihan ( Croi Nurse ) and Andy Moran ( Mayo GAA and The Movement Gym). Ray Moylette – World & European Boxing Champion having a Body Composition Scan at Mayo Medical Centre. Picture with Eileen, Madeline and Joanann from Mayo Medical Centre. We had the pleasure of carrying out Full Body Composition Scans on some members of the Mayo Ladies football team recently. Mr. Bennett represents Ireland on the European Board of Orthopaedics and Traumatology in Bergen Sweden. Pictured on the left with the Norwegian representative Dr Kari Indrekvam and EBOT President Dr Paulo Felicissimo. On the 18th May Mayo Medical Centre hosted a public information evening on Arthritis and Weight Management in Breaffy House Hotel. Our panel of experts on the night included Mr Derek Bennett (Orthopaedic Surgeon), Mr Chris Collins (Bariatric surgeon), Dr Francis Finucane (Endocrinologist) and Caroline Brosnihan (Dietitian). We would like to thank all those who turned out on the night, to our speakers for sharing their expertise with us, to Breaffy House Hotel for facilitating us and to the Mayo Branch of Arthritis Ireland for their support. OPERATION WALK IRELAND Mr. Derek Bennett and the Irish team head to Vietnam as the first ever European chapter of Operation Walk. Operation Walk is an American based charity which perform hip and knee replacements in third world countries where these life changing operations are not available. Operation Walk was set up in 1996 by Dr Larry Dorr, Los Angeles and has since expanded to form 15 separate chapters in North America. The first independent Operation Walk Ireland mission is currently underway in Vietnam where Mr Bennett and a group of 60 medics are hard at work performing joint replacements, while at the same time educating the Vietnamese surgeons, anaesthetists, nurses and physiotherapists. April 2nd: Dr Faisal Sharif speaks on Midwest Radio about the new cardiology services at the Mayo Medical Centre .To listen to the clip please see link in our media section below. March 30th: Operation Walk medical relief shipment leaves the warehouse in Galway bound for Hanoi, Vietnam. 2 1/2 tonnes of medical supplies worth €600,000 were shipped. Congratulations to all concerned in Operation Walk Ireland for their huge efforts. March 17th 2017 Mr. Derek Bennett elected vice president of the Irish American Orthopaedic Society. Pictured on the left with his Excellency Kevin O’Malley US Ambassador to Ireland. February 7th: Mr Derek Ben nett was interviewed on the Sean O’Rourke show on RTE 1 in relation to initiatives to shorten the waiting list for joint replacements in Ireland. To listen to the interview in full please click the link below. The annual Mayo Arthroplasty Conference (MAC) took place from 24th-26th February 2017 in Knockranny House Hotel in Westport. There were over 100 Irish and International experts in the field of joint replacement in attendance. This years theme was primary knee replacement. November 10th and 11th will see Mr Derek Bennett speak at the Bristol Hip Arthroplasty Conference for the second year in a row. Mr Bennett was the first Irish Orthopaedic Surgeon to be asked to present at the course in 2015. The Mayo Medical Centre would like to thank everyone who attended our Public Information Evening on Tuesday 18th October 2016 in the TF Royal Hotel. We apologize to anyone who wasn’t let into the event as interest in the event was immense. We hope to hold another meeting in the New Year so keep your eyes on our facebook page and here on our website for more information about upcoming events. We would like to thank our expert speakers, Liam Leonard, Mr Osman Yagoub, Caroline Brosnihan, Mr Derek Bennett and Professor Moira O’Brien, who provided detailed and interesting talks on the topic of Osteoporosis. We would like to thank our chairperson, Dr Richard Tobin for keeping the speakers in line on the night. If you have any queries about Osteoporosis treatment, prevention or screening, please contact us on 094 9020202. Mayo Medical Centre, in conjunction with the Irish Osteoporosis Society will be hosting a Public Information Evening on Tuesday 18th October 2016 at 7pm in the TF Royal Hotel, Castlebar. Did you know that hip fractures have a higher death rate than heart disease and cancer combined? Come along to learn about the risk factors, diagnosis, treatment and prevention of Osteoporosis. The Annual Meeting took place from 1st to 4th June 2016 in NUI Galway and was attended by clinicians from around the world. Mr Bennett presented at the meeting. In May 2016 Mr Derek Bennett was nominated as Director of the Irish Operation Walk Committe which joined Chicago Operation Walk in Hanoi, Vietnam in April and successfully completed over 80 joint replacements. We wish the team every success with all future missions. Operation Walk Ireland aims to go to Vietnam on its first solo mission in April 2017. Operation Walk is an American charity, who for the past 18 years have organized missions to Third World countries to perform hip and knee replacements for patients who could not otherwise have access to this life transforming surgery. To keep up to date with Operation Walk Ireland developments follow them on Facebook https://www.facebook.com/operationwalkireland/?fref=ts. Their website is under development and will be operational in the near future. Mayo was host to the country’s largest orthopaedic conference last weekend (April 15th-17th 2016). Surgeons from as far away as Los Angeles and Singapore attended the annual Mayo Arthroplasty Conference which was held in Knockranny House Hotel in Westport. The conference, which is chaired by Mr Derek Bennett has evolved over the last 8 years to become the largest orthopaedic conference on the island of Ireland. Orthopaedic surgeons from all around the world showcased the latest technological advances in hip and knee replacement surgery. This year’s conference co-hosted the annual general meeting of the Irish American Orthopaedic Society (IAOS) and there were numerous orthopaedic surgeons who specialise in hip and knee replacements from all over the United States. A special “Lifetime Achievement Award” was make to Dr Peter Sharkey of Philadelphia, Pennsylvania for his lifelong contribution to advances in orthopaedic research, implant materials and surgical techniques. Dr Sharkey works at the prestigious Rothman Institute in Philadelphia which is one of the premier hip and knee replacement centres in the world. Dr Sharkey has been responsible for training numerous orthopaedic surgeons in advanced techniques in hip and knee replacements. Dr Sharkey’s great-grandfather left Ireland in the early part of the 20th century. The award was presented by his excellency, Mr Kevin O’Malley, Ambassador of the United States to Ireland, who recognised the dedicated work that Dr Sharkey has carried our throughout his career. His Excellency also recognised the excellent work carried out by the orthopaedic charity Operation Walk. This charity carries out hip and knee replacements in third world countries all around the world. The charity has set up chapters in numerous cities throughout the United States after being founded by Dr Lawrence Dorr in California twenty years ago. The conference was also addressed by Dr Lawrence Dorr, who congratulated the Irish orthopaedic community on forming the first international chapter of Operation Walk which recently carried out a charity mission in Hanoi Vietnam under the direction of Mr Derek Bennett, chairman of the Irish chapter of Operation Walk. 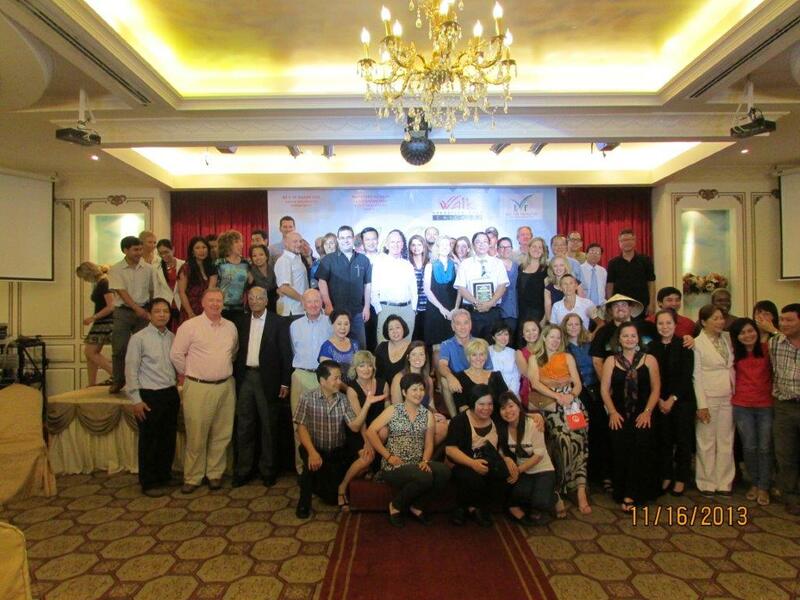 The Irish mission to Hanoi performed more than 80 hip and knee replacements in needy patients in Vietnam. Dr Dorr congratulated Mr Bennett and his remarkable team on their achievement of setting up the first international chapter of Operation Walk. The conference was universally regarded as a huge success and has enhanced not only the knowledge and skills of Irish orthopaedic surgeons but has strengthened the bonds between Irish and American orthopaedic surgeons. For the last number of years Mr Bennett has worked with the Operation Walk charity. 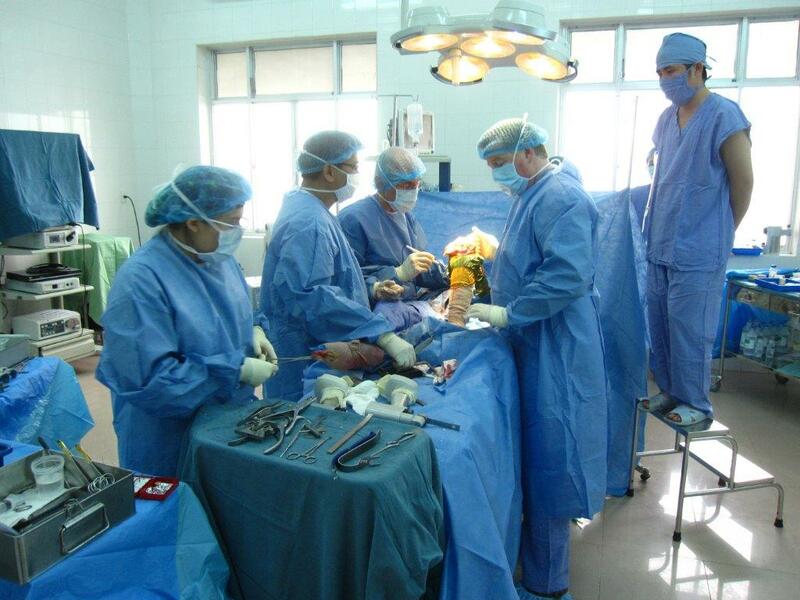 This charity performs hip and knee replacement surgery in third world countries. The team consist of specialist hip and knee replacement surgeons, physiotherapists, theatre nurses, ward nurses, and rehabilitation specialists. The Operation walk team is fully self-contained and transports all necessary equipment and implants from the United States to the mission venue. This year Mr Bennett lead a team of his own from Ireland who joined the mission with our Chicago counter parts. 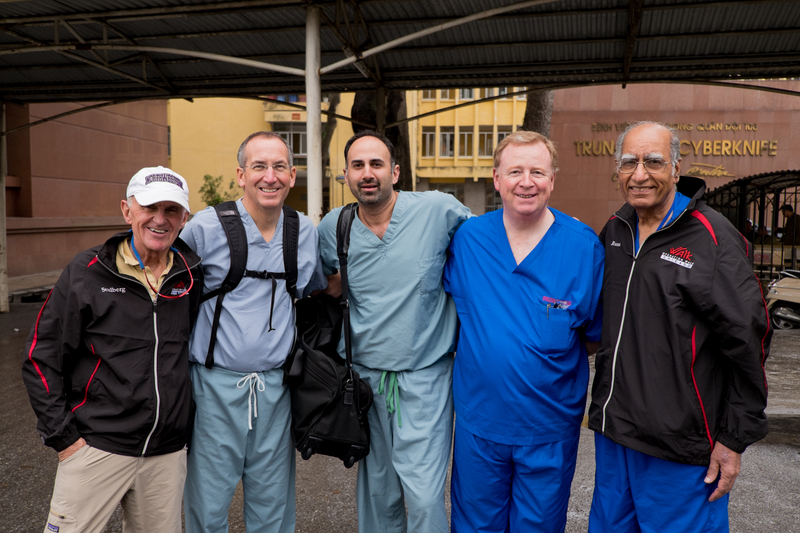 On the 2015 mission to Hanoi Vietnam the team performed 65 complex hip and knee replacements over a 5 day period. This year there were a staggering 86 joint replacements performed. Here at Mayo Medical Centre we would like to congratulate Mr Bennett, our physio Conor Mc Hugh and all who voluntarily gave up their time, to share their expertise with those less fortunate.